“Miles Ahead” Lags Bars of Beats Behind - TheUrbanMusicScene.com | Music Reviews! 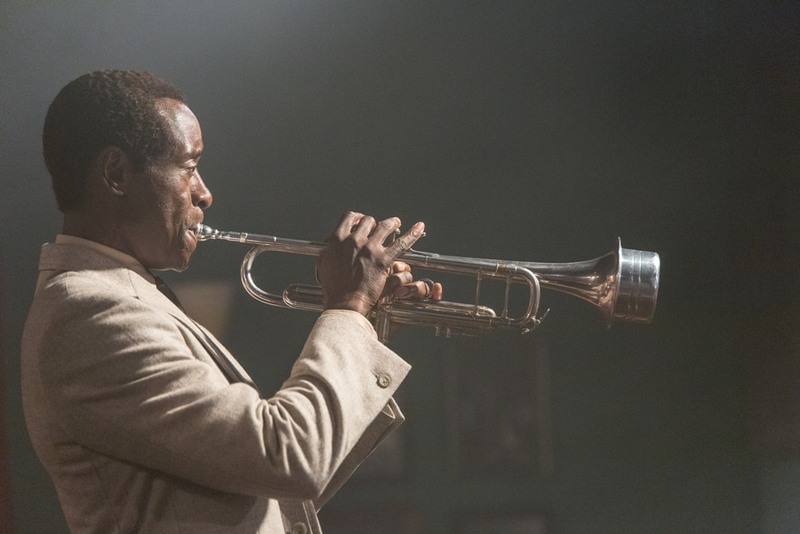 For Miles Davis whose artistic and personal essence was “no compromise” at fortissimo, the hybrid fictional movie “Miles Ahead” undeservedly smacks of way too much of it. Actor Don Cheadle, making his directorial debut here, gives a performance of bravura voodoo as the iconic, forward-marching musician. Yet he and co-screenwriter Steve Baigleman created a convoluted maze of a story in which to contextualize it – dually necessitated by Cheadle’s choice to play between the lines as opposed to the melody as written…and Hollywood’s infuriating insistence on giving even the boldest of real life black men a white knight. 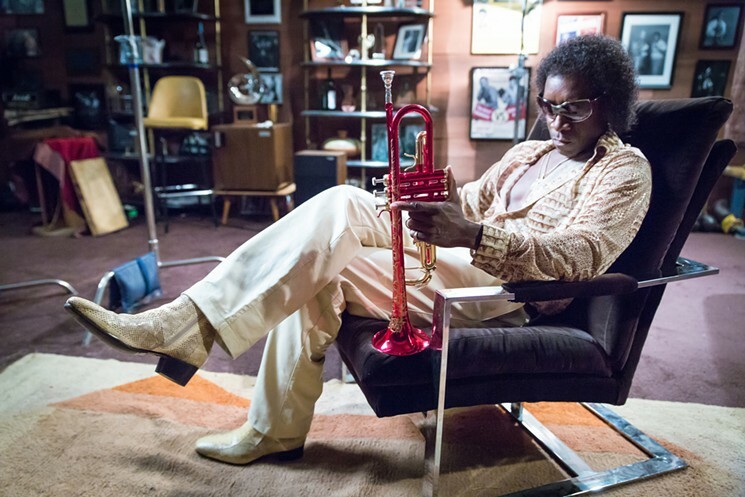 “Miles Ahead” revolves around a series of “what if” scenarios in Miles’ late `70s semi-retirement involving fictional Rolling Stone reporter Dave Brill (gamely played by Ewan McGregor) gate-crashing his seclusion to demand an exclusive expose’ interview which turns into an absurd storyline about a reel-to-reel tape of unfinished music stolen from Miles’ home that the trumpeter wants back at any cost (gunplay is involved). Embittered and solemn moments of reflection flash us back to key scenarios in Davis’ life and career – from fabled recording sessions with arranger/conductor Gil Evans and that night a white cop put a blackjack upside his head to intimate moments of bliss and rage with love of his life Frances Taylor (portrayed with elegance and required fire by Emayatzy Corinealdi). As a night out at the movies, “Miles Ahead” is entertaining on the surface. You see nods to his love for boxing, his eye for art, his volatile temper and simmering insecurities. There’s a hilarious reference to his classic “So What” by an incidental character’s girlfriend and a heart-melting peek into the inspiration behind a lesser known composition, “Fran Dance.” Roundly, the use of Davis’ music from across the decades of his changing sounds keeps our ears ravenously riveted. However, for anyone looking into an examination of the complexities of Davis the man and the tortured icon he became, the very best parts of the film are but an infuriating tease of what could have been. It is understood that a true biographical film of Miles Davis’ life and career would be an epic undertaking deserving of three hours minimum and a miniseries at maximum to sufficiently tell, but what better subject from a historical and commercial standpoint? Miles’ life had all the Gemini dualities, artistic high watermarks, sidemen, side-pieces, drugs and rock n’ roll known to put butts in seats. That real movies about black artists with rich and colorful built-in stories are doggedly tainted by unnecessary subplots, non-existent or composite characters and/or flat-out falsehoods should be tantamount to prison time. Sir Miles Dewey Davis III, James Brown, Nina Simone, Jimi Hendrix, Bessie Smith, Marvin Gaye and more deserve the respect and honor of receiving the royal treatment of their lives rendered on film before said lives are waywardly ushered down the art house route for capricious flights of fancy. For sins such as this against the ‘Prince of Darkness,’ “Miles Ahead” lags bars of beats behind. 2 Responses to "“Miles Ahead” Lags Bars of Beats Behind"
Scott; I have nothing but respect for your opinion on most reviews you perform via writing in the Urban Music Scene. I already prepared myself for a loosely , fitted vehicle to exploit the brand. With the family on board as validation, even if the Film only make marginal money, the Brand will proceed with an avalanche of products and gizmos to make money. You and I and other true fans of the music are heart-broken and disappointed.. I probably won’t see this “FLICK” until it goes DVDs or Cable.. Thanks for your honesty. Thank you for taking the time to read my piece and leave a comment. I would hate to think of this movie being made as a forecast of money grabs to come. I just think conscientious artistic control and thematic focus derailed like a runaway train. Whenever/however you ultimately see this film, I welcome you to revisit this review and page then share your thoughts. Respect.